I heard recently on a movie a child explain the world like toast and our lives like butter. It is so big and there are so many things we need to do, so many places to go, so many things to see, that our time ends up being spread so thin. Everyone's saying "pick up the pace", "get a move on", "hurry up"... I could be totally cliché and say that we all need to slow down. But, I feel exactly like that kid - I'm getting old and running out of time! I still want to do so many things but who knows if I'll get to all of them. I got to these cheesecake squares though, that's for sure. 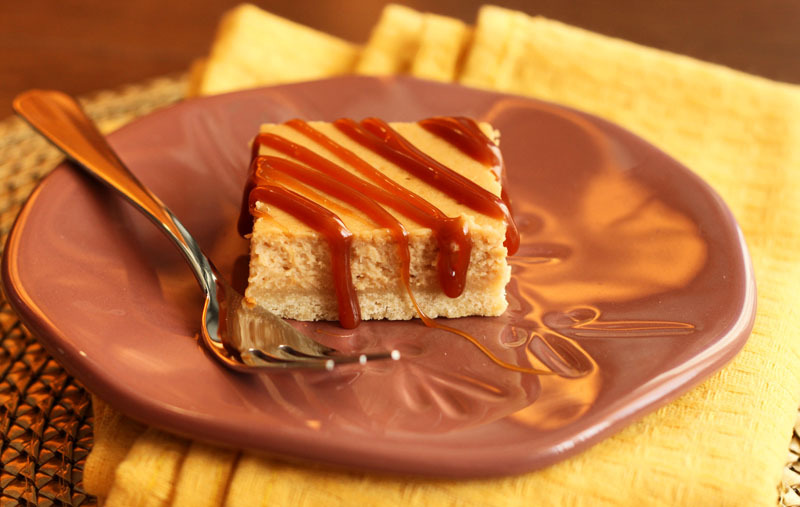 The name "caramel" isn't only owing to the drizzle you see on top, but it's the robust, rich, cooked sugar flavour that's themed throughout the whole dessert. 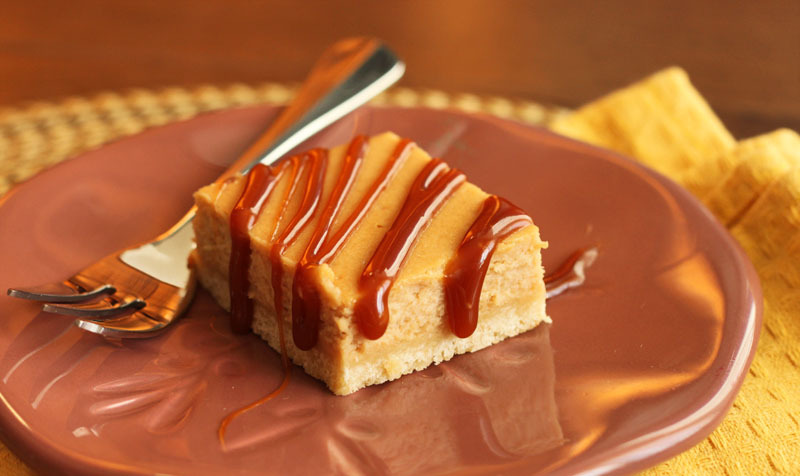 The crust tastes like toffee thanks to golden brown sugar and melted butter. It makes a sturdy but still crisp base that softens slightly over time, making it taste even more like toffee, but it never gets soggy. When I worked at Baskin Robbins (one of the happiest times of my life) more than 15 years ago, I used to dunk our bananas (meant for banana splits according to the boss, but meant for my tummy according to me) into a cup of caramel and maybe some peanuts if I felt like it. It's alarming to realize how many things you want to dunk in caramel when you have a bottomless bucket of it always within arms length. The cream cheese filling is also made with dark brown sugar and a hint of molasses to call out those toffee/caramel flavours. It makes the banana taste like adult banana... not kid banana. You know, like those yellow Runts candies? Or that awful stuff they put in your mouth when you get fluoride treatments at the dentist? It's not that kind of banana. To talk about texture, this cheesecake is hard to over-bake thanks to the moisture loving addition of molasses and the starchy banana. You definitely need to chill it sufficiently to let it set up so you get nice clean slices. It will be set, but still silky smooth like a perfect cheesecake should be. You should fight for the middle square if you have it in ya. Preheat oven to 350°F and line an 8x8” square pan with parchment paper. To make the base, combine flour, corn starch, brown sugar, salt and baking powder in a medium bowl and blend evenly, removing any lumps of sugar. Stir in melted butter and work it in with your hands if necessary to blend well. Tip mixture into prepared pan and press down evenly. Bake until lightly golden, about 10-13 minutes, and let cool completely. Reduce oven temperature to 325°F. To make the filling, place cream cheese in a food processor and blend until smooth. Add sugar and molasses and blend well. Blend in egg, followed by banana puree, vanilla and flour until smooth. Pour mixture over cooled crust and bake until set, about 15-20 minutes. Transfer pan to a wire rack and let cool completely at room temperature before refrigerating for 2 hours. 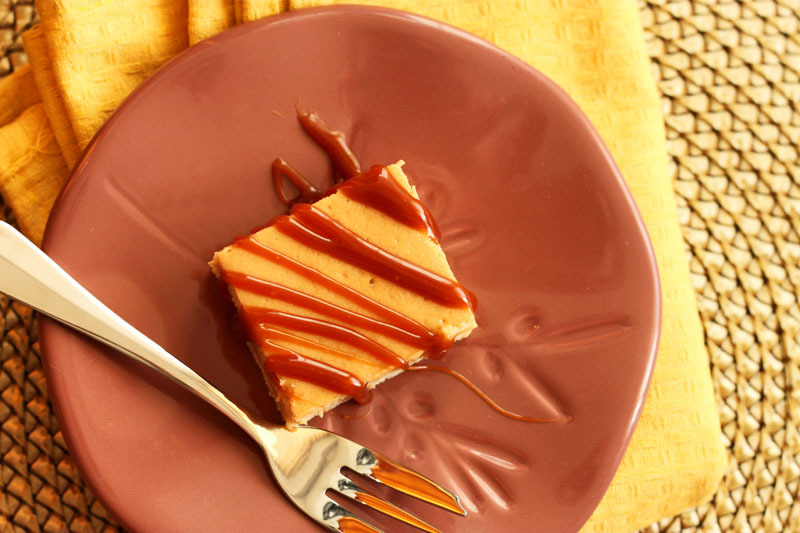 To make caramel sauce, place water in a small saucepan. Sprinkle sugar over in an even layer and cook over medium heat, swirling the pan frequently as it starts to caramelize but do not stir. Once it reaches a nice dark amber colour, remove from heat and carefully stir in cream. It will bubble up vigorously. Stir in butter and salt. 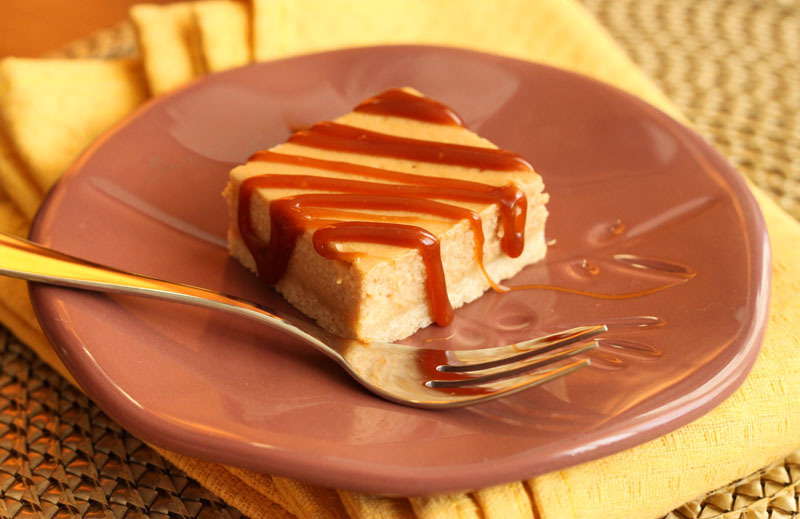 Transfer caramel to a separate bowl and let cool completely before drizzling over sliced squares. This looks amazing! What is banana puree? Is it the same as mashed bananas? I enjoy your blog and this looks like a wonderful recipe. Are you saying to "fight for the middle squares" because they are creamier after baking? I was wondering if baking it in a water bath would help the edges from getting more well done than the center.